Casino Royale (2006) is the twenty-first film in the James Bond series; it was directed by Martin Campbell and the first to star Daniel Craig as MI6 agent James Bond. Based on the 1953 novel of the same name by Ian Fleming, it was adapted by screenwriters Neal Purvis, Robert Wade, and Paul Haggis. It is the third screen adaptation of the Casino Royale novel. It was previously produced as a 1954 television episode and a 1967 satirical film. The film is set at the beginning of James Bond's career as Agent 007, just as he is earning his license to kill. After preventing a terrorist attack at Miami International Airport, Bond falls for Vesper Lynd, the treasury agent assigned to provide the money he needs to foil a high-stakes poker tournament organised by Le Chiffre. The film's story arc continues in the 22nd James Bond film, Quantum of Solace. However, the 2006 film is the only EON Productions adaptation of Fleming's novel. It is a reboot of the Bond franchise, establishing a new timeline and narrative framework not meant to be preceded by any previous film. This not only frees the Bond franchise from more than forty years of continuity, but allows the film to show a less experienced and more vulnerable Bond. Casino Royale was released on 16 November 2006. The casting for the movie involved a widespread search for a new actor to portray James Bond, and significant controversy over Daniel Craig when he was eventually selected. Some Pierce Brosnan fans threatened to boycott the film in protest. Despite this, the film, and Daniel Craig's performance in particular, earned critical acclaim. 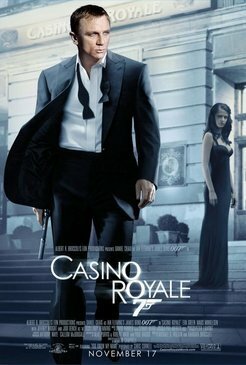 Casino Royale was produced by EON Productions for Metro-Goldwyn-Mayer and Columbia Pictures, marking the first official Bond film to be co-produced by the latter studio, which had produced and originally distributed the 1967 non-canonical film version. The 2006 version is the highest-grossing Bond film, without adjusting for inflation, making $594,239,066 worldwide.